The Elgeeco clam action catching cages can be set in numerous configurations around the decoy cage or they can be employed separately in different locations with more chances of catching a decoy bird. 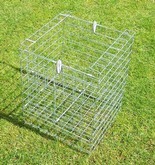 Comprises a foldable flat pack design top entry cage with an additional side door for safely removing captured birds. The top entry doors are closed by an innovative cage floor release which eliminates the need for a separate wood perch and also reduces the risk of accidentally trapping birds between the doors.